We all want to say ‘Cheese’ when a photo is clicked. But, for some, tooth discoloration or stained teeth makes them cautious and even affect their confidence level. It is definitely not a disease but can be an effect of some ailments, food or habits. Several diseases that affect enamel (the hard surface of the teeth) and dentin (the underlying material under enamel) can lead to tooth discoloration. Even other treatments like head and neck radiation or chemotherapy can cause teeth discoloration. In addition, certain infections in pregnant mothers can cause tooth discoloration in the infant by affecting enamel development. The antibiotics tetracycline and doxycycline are known to discolor teeth when given to children below 8. Mouth rinses and washes containing chlorhexidine and cetylpyridinium chloride can also stain teeth. Antihistamines (like Benadryl), antipsychotic drugs, and drugs for high blood pressure also cause teeth discoloration. Some of the materials used in dentistry, such as amalgam restorations, especially silver sulfide-containing materials, can cast a gray-black color to teeth. 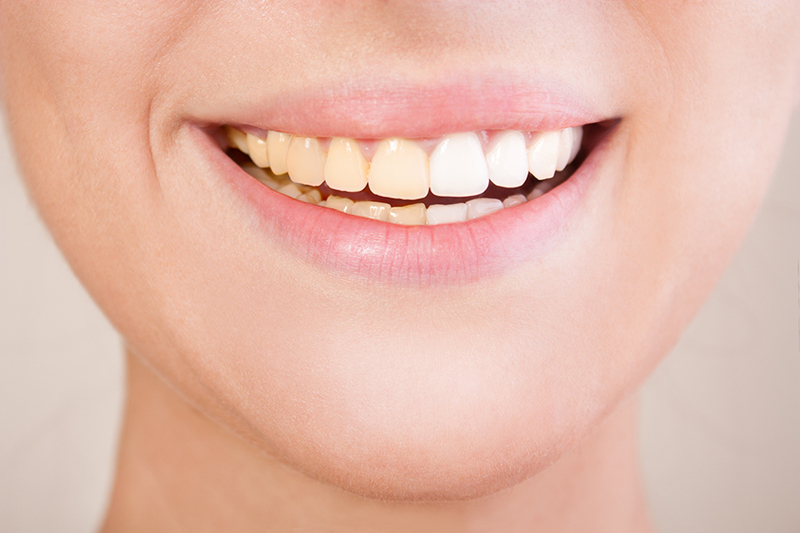 With aging, the outer layer of enamel on your teeth gets worn away, revealing the natural yellow color of dentin. Excessive fluoride either from environmental sources or from excessive use through rinses or toothpastes can also cause teeth discoloration. For example, damage from a fall can disturb enamel formation in young children whose teeth are still developing. Trauma can also cause discoloration to adult teeth.